Find Bessemer City, NC Homes for sale. View Photos, Maps and MLS Data Now! Laurel Creek - There is a large outbuilding and children's play-set in backyard, both to convey with purchase. MLS#3491952. Hanks Realty Group. New updated kitchen with stainless appliances, new floors, and new windows. HVAC system is also new. MLS#3495345. Gilleland Realty Inc. Spacious home in a private county setting, living room, dining, the kitchen is an open area, Lots of cabinets and counter top space, laundry room, master bedroom has a large walk-in closet, master bath with garden tub and separate shower, features a covered area, Roof is approx 3 years old, HVAC installed 2017, the right side of the property is bordered by a creek, property has road frontage on Webb Rd but uses the private subdivision street as entry MLS#3496286. Vickie Spurling Realty Inc.
PILOTS RIDGE - Convenient to shopping, restaurants and easy access to major highways. MLS#3492784. Fathom Realty NC LLC. You will love the laminate wood flooring throughout this home and the wainscoting, granite counters, and tiled floors in both bathrooms can't be missed. MLS#3493254. Allen Tate Gastonia. Large eat in kitchen ,split bedroom floorplan one 1 ac. lot in cud-de-sac . MLS#3490783. iTrend Realty. Gas log fireplace in living room. Will not last long! MLS#3490472. PMI Realty LLC. The home sits at the end of the street. MLS#3490115. Carolinas Realty. Apple Orchard - This house is ready for you! 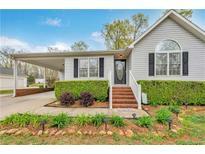 MLS#3488485. SRP The Agency Inc. Whether you are a hobbyist, a collector or need it for work, a 2400 sq ft building makes everything better! MLS#3489253. RE/MAX Lifestyle. Utilities are not on. SOLD AS IS WHERE IS. MLS#3489941. L&E Properties. Photos are representative of the type of materials and finishes this home will have. MLS#3487591. Costello Real Estate and Investments. Also over half of the windows have been replaced and a new HVAC installed this year. Nice almost fully fenced yard. MLS#3485459. Carolinas Realty. MLS#3485006. Key Real Estate Group LLC. Pre-1978 Properties to include LBP Notices, Seller may contribute up to 3% buyer closing costs, upon buyer request when bid is placed. "EQUAL HOUSING OPPORTUNITY" MLS#3484067. Showcase Realty LLC. There is a gas wall heater also ! MLS#3483738. Dean Carpenters Real Estate Inc.
Nice Ranch with basement, waterproofed basement with sump pump, hardwood floors, nice screened in porch, wood burning fireplace in L/R., 3rd bedroom has washer/dryer installed, master bedroom was enlarged by removing wall to 4th bedroom, house has nice size living room and dining room, dog lot and 10x14 building, Note: Shared driveway and railroad track behind property, range, dishwasher, refrigerator, washer and dryer remain. MLS#3482404. Allen Tate Gastonia. Come and see it, you won't be disappointed! ! MLS#3482089. Fathom Realty NC LLC. Young first time home buyer got cold feet! MLS#3482030. Buddy Harper Team Realty. 2 storage buildings - one is wired. Level large yard. MLS#3481025. Moss Realty. Buyer will be responsible for clearing title to the mobile home and seller will require the buyer to sign a Hold Harmless agreement in relation to this mobile home. MLS#3478164. Vickie Spurling Realty Inc.
New owners can complete or remove. New HVAC installed in 2018. MLS#3476415. Allen Tate Gastonia. PILOTS RIDGE - Great Location and easy access off Hwy 321, Convenient to Shopping and Restaurants. MLS#3473960. Fathom Realty NC LLC.